A major shake-up is set to hit Home And Away — with four cast members to be written out by the end of the year. Scriptwriters have just mapped out the storyline to mark the exit of teacher Luke (John Adam), while on-again, off-again lovers Tug (Tristan Bancks) and Sarah (Laura Vasquez) are tipped to be next to go. Producers of the series are also said to be planning a mid-year exit for Roxy (Lisa Lackey, pictured), though producer Andrew Howie has refused to comment. 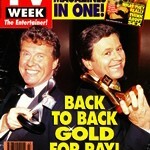 “We haven’t even entertained the idea,” he told TV Week. But recent interviews to Australian and British press where Lackey claimed her frustration at being a soap star and admitting to on-set tantrums have not endeared her to her employers. Former Neighbours star Lochie Daddo has impressed the producers of GP with his portrayal of the lover of the series’ new doctor, Martin Dempsey (Damian Rice). But the 24-year-old actor admits to cringing when looking back at the couple’s love scenes. “I remember feeling very nervous,” he told TV Week. “I must admit I cringed a bit when I had to watch the kissing scene again. It was a difficult scene to film. The director kept saying, ‘I think we’ve got it, but we’ll do it again just to make sure’. I think we must have filmed that scene four or five times.” Despite his discomfort in taping the scenes, he is proud of what he has done and hopes it goes some way to stamping out homophobia. “There is so much more to a person than their sexuality,” he said. Elle McFeast (Libbi Gorr) has embarked on a Top End tour to launch the upcoming return of Live And Sweaty. McFeast (pictured) and a film crew toured the Northern Territory, including the Tiwi Islands, to meet some of the sporting characters of the Top End — including Helen Fejo-Frith, coach of the local football team at Burunga, an Aboriginal community 80 km from Katherine. “Helen coaches football, baseball and basketball. And she learns her coaching skills by watching these sports on television,” McFeast told TV Week. After only a few weeks on air, a number of staffers behind Alan Jones Live are already moving on, with four production staff leaving on the same day. But despite claims of low morale behind the scenes, Ten‘s director of news, Carmel Travers, insists the show will go on. Meanwhile, Jones’ predecessor Derryn Hinch may be having trouble settling in to his new role as host of Nine‘s Midday. Rumours claim that all is not well between Hinch and the show’s music chief Geoff Harvey. Network Ten‘s new series Heartbreak High has held a launch party for around 200 guests at the playground of a Sydney high school. Attendees were ushered in by a cane-wielding headmaster and once inside were greeted in the schoolyard by acrobatic displays from inline skaters and invited to check out graffiti, play the pinball machines and raid the lolly-laden tuckshop. Saturday: The Final of the Mercantile Mutual Cup dominates the day for Nine (9.59am to 1.30pm, then 2pm to 6pm), while Seven crosses to Waverley Park for the Semi-Final of the AFL Fosters Cup (8.30pm). Sunday: Kate Paton hosts the live telecast of the Moomba Masters Waterskiing (12pm, Seven, and again on Monday). In Heartbreak High (6.30pm, Ten), Christina (Sarah Lambert) volunteers to coach the school soccer team, but finds herself in the hot seat when Danielle (Emma Roche) proposes to join the team. Sunday night movies are Honeymoon In Vegas (Seven), The Power Of One (Nine) and Hook (Ten). Monday: In Home And Away (7pm, Seven), Michael (Dennis Coard) blames Pippa (Debra Lawrance) for driving his son out of the house. In Healthy Wealthy And Wise (7.30pm, Ten), Tonia Todman and Jim Brown discover the scenery, festivals, history and culture of Thailand, while Iain Hewitson prepares a Thai crispy fish salad. Tuesday: In GP (8.30pm, ABC), Patrick Wales (Lochie Daddo) a gay man who offers his kidney to his sister Judy (Sonia Todd) for a transplant is refused by doctors as his sexuality is considered to be an unacceptable risk. Former ABC host Andrew Denton makes his long-awaited debut on Seven with his new late night show, Denton (10.30pm). Wednesday: In the series final of Newlyweds (8pm, Seven), Peter (Chris Gabardi) and Allie (Annie Jones) decide it’s time to tell their families about their pregnancy, and Jules (Cathy Godbold) accepts Uri’s (David Argue) marriage proposal. Kym Wilson narrates the documentary Growing Up Fast (8.30pm, ABC), looking at the generational differences between teenagers and their parents, including archival footage spanning the decades. Youth current affairs show Attitude (9.30pm, ABC) returns for a new series. Thursday: In Home And Away (7pm, Seven), Michael (Dennis Coard) fails to realise that his son has a deep secret. In Beyond 2000 (7.30pm, Ten), Iain Finlay examines the world’s first handheld electronic route-finder, and Dr Caroline West meets a professor who has developed a means to read the previously unreadable script of the Dead Sea Scrolls. Friday: In Neighbours (6.30pm, Ten), Pam (Sue Jones) lies about a floral gift. In Rex Hunt’s The Great Outdoors (7.30pm, Seven), Ernie Dingo meets a couple of modern-day gold prospectors, Neil Crompton and Sofie Formica test drive the luxurious Range Rover Vogue Plus, and Penny Cook visits the town of Berri. British series Harry Enfield’s Guide To The Opera (8pm, SBS) includes an interview with Dame Joan Sutherland. Late night sports show Live And Sweaty (10.30pm, ABC) returns for 1994, with host Elle McFeast (Libbi Gorr) joined by Karen Tighe, Debbie Spillane, Rex Mossop, Peter ‘Crackers’ Keenan and Lex Marinos.